June 2nd, 2017: In today’s show I talk to you about How To Recharge Your Batteries. It is important to take good care of ourselves and to not allow ourselves to get run down. It is also important to do fun things and take time away from all your work to PLAY! To be our best selves we can be, we need to take recharge ourselves. Welcome to the Mountain Woman radio, where we are homesteading traditionally 100% off-grid today and offering preparedness and survival tips for tomorrow. Here’s your host, Tammy Trayer. Tammy: Hey everyone, I’m glad to have you joining me, this is Tammy Trayer you can find my family and I at trayerwilderness.com. 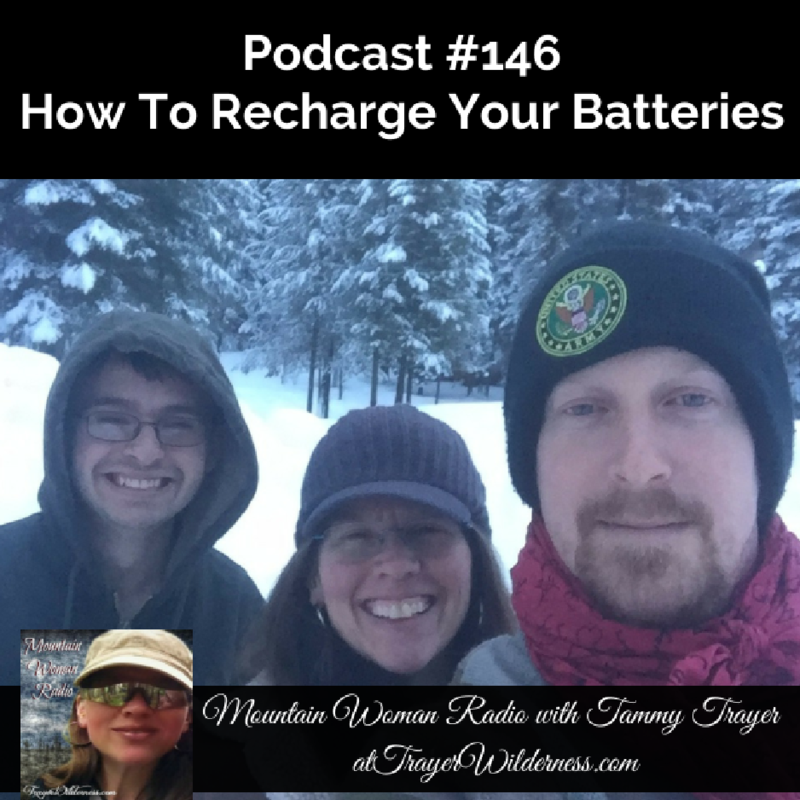 Today we’re going to talk about how to recharge your batteries as a parent and as a spouse. We just passed Mother’s Day and we’re coming up on Father’s Day and both parties need to be celebrated. Either position is an easy one and struggle is we are running that rat race, work in our day jobs, volunteering and getting the kids here and forget to take time out of the week for you and your spouse, you don’t have the quality time you want with your kids, and you just start to hit ban out, you have ban out, you start to let those negative voices, that you share with yourself start affecting you and we all go through it. I know I’m not singled out and I hope you feel better knowing you’re not alone because it just happens you know. Kids might get tudy, you and your spouse might have a tiff. You know all those things kind of make you feel lesser, inadequate or not a good mom and not a good wife and not a good husband and we go through that negative talk and for starters that’s the first thing you’ve got to curb. And for those of you that have never paid attention to that, these can be really eye opening for you because we’re all guilty of it and we’re all super good at it and you know you guys know I’m a Christian-that’s the enemy in my opinion, digging in and using those negative words to dig–to allow it to degrade ourselves and to degrade our souls and–just put us in a weird spot and we all end up there despite how hard we try to be positive and happy and everything to go right these always never go that way and that’s reality. You go through valleys, you go through rough days, you have good days-you know so how do you find that balance and how do you recharge your batteries? For many people that can be a real struggle, I feel kind of blessed because I have good friends, I have good family, I have good spiritual advisers, I have my Bible and I have God and those things really–you know when you really learn how to use some tools and there’s nothing wrong with leaning on a friend or a spouse you also were there for we’re supposed to be helpmeet and great that men are fixers, so sometimes when you share your struggle with the men, they get a little bit upset because they can’t fix it or they try to fix it and you didn’t want to fix it you just wanted to listen right? Well got to give him credit for trying to fix it; he’s trying to help you but that’s his way of doing it. So when you decide to share something with your spouse that’s really bothering you, you know maybe you can say to them you know I’m sharing this with you, I know you can’t fix it and I don’t expect you to mileage kind of just looking for you to listen because sometimes just having that listening ear can be so huge. You know my Mountain boy has been my listening ear. Many times we walk all the time and you know sometimes my dogs, when you’re home by yourself and just feeling a little disheveled, you know I’m not the only one. I know other people talk to their animals right? [chuckles]. Anyway, it’s just important to express ourselves, it’s important to get these things off of our chest, out of our system and by expressing it you’re depleting it, you’re getting rid of it and oftentimes that’s just what you need to do. But it’s a process and it’s learning these things. So first of all, if you hear negative talk coming out of your mouth, you know it could be anything, it could be: I’m not a good wife, I’m not a good mom, I look fat, whatever it is, we’re all guilty of it, we all have our thing we all have things that bother us about ourselves and that’s a process too of becoming whole with ourselves up to a point that we are finding happiness in ourselves and basically seeing ourselves the way God sees us and that’s really important and getting rid of that negative talk is huge. That negative talk-you know as soon as you hear it, reverse it turn it around. You know I’m a bad mom, no really I’m not you know Johnny was misbehaving I did what I needed to do he’ll love me later and he’ll be a better person for it you know. You got a–you got to want to turn these things around because those negative words can be really rough on you and will really put you in bad places. Having a good friend to confide in and that’s just expressing yourself. One thing I do want to encourage you folks though is, it’s really important not to talk about your spouse you know we all go through rough spots. If you have somebody that you can talk to that you fully trust and you are having a situation and you need somebody to talk to about it, that’s good but be careful who you talk to, don’t go sharing information-personal information to everybody because one of the things you want to do when you’re in your life and finding balance and recharging your batteries for you and your spouse is to not plant negative seeds. You know rumors get started, bad things get spoken, this is not a good way to do things. You know when my husband and I have a struggle-and don’t get me wrong we live an awesome life but we have struggles, we’re no different than you and when we do, we have a couple of rules one, we don’t go to bed angry, we don’t leave the house angry and we talk about it and that may mean that we might need to cool down or both need to walk away regroup ourselves and then go have a conversation. My thoughts are, when I have a problem with my spouse my husband, the best thing I can do is talk to him about it. And for those of you out there that could you know–if you were in an abusive situation or something is really wrong in your relationship and you are in danger or your children are in danger, please that’s a whole different whole story, whole different ballgame and if you are in this situation I thoroughly encourage you to talk to somebody and really seek help if that’s the case. But under normal circumstances, you don’t want to be badmouthing your spouse and you want to be there to help me, you want to lift them, you want to love them, you want to encourage them. There’s nothing worse in this life than being discouraged by the person you live with and not feeling loved. So in your efforts to find balance, I certainly hope that you have a date night every week, every other week once a month no less than that. You spend time just you and your spouse, if you have children – no children, if you don’t have children – no work, no iPhones, no nothing. Just spend time with your spouse, doing something you both enjoy and you might need to take turns, because maybe what he likes to do, you don’t like to do and maybe what you like to do he doesn’t like to do. But you’ve got to find even and fair playing ground and take turns to feed each other’s batteries to give each other Joy. You know it’s–we all require different things to nurture us and that’s basically what it boils down to when we’re recharging our batteries. Is refilling our joy in our lives and refilling our reservoirs with things that we need and we’re the only ones that can really establish that and you might need to sit down and talk to your spouse about it and figure out what it is that you both need. And you know sitting down having those conversations you can learn so much and you know when you’re in the high romance of a relationship and then you get married, you know if things do change and it doesn’t have to be for the worse, you’re going to change, you’re going to start to learn each other, you’re going to start to realize things but that’s where you guys have the opportunity to grow together and in order to do that, you need to both be very open and understanding with each other and-it’s a process. But for me finding my balance is taking time also in God’s Word. I do that every day because without it I feel really disconnected and it just-it feeds me, it feeds my soul and it keeps me connected where I need to be connected and that’s how I start my day. So that is one way, but don’t get me wrong. I’ve had those days where the week has just been hideous and I do that every day and I feel connected and I feel good but I just still feel out of sorts and often times in my mind I feel that’s spiritual warfare; that’s the enemy trying to get in and just deplete our positive nature and–so I focus really hard when I’m in those modes and doesn’t happen often but it does happen. You know I’ll go out for a walk, I’ll go ride my bike. Sometimes for people a good cry, you know you’ve got a lot of stress, you got a lot going on you’re getting hit left and right from all kinds of things, kids are acting up, it’s full moon, schools calling and you know you just–cars breaking down, you get all the stuff, it’s tough and we’re human. It’s our human nature and it’s okay to break it, it’s okay to fall apart. Cry, get it out of your system and oftentimes you’ll find when you do that, you pull yourself back together-you just need to release it all. So if you can’t–if you can’t–if you want somebody to talk to, you know hey, e-mail me survive@trayerwilderness.com. We all need a friend, we all need that somebody sometimes and you know there’s ways to handle it: Praying-having open communication with God, communicating with our spouses is so important and sometimes if the kids are giving you a rough time, the best thing for you and for them is to just step away, step away, clear your head–I find sometimes when my Mountain boy used to have struggles we were homeschooling, so we just get up, he did not like it because he liked to stay focus on a school work but he wasn’t being productive, he wasn’t doing-he just wasn’t helping himself in any way. It was just not a good situation get–up we’re going for a walk by the end of the walk we’d be laughing and carrying on go back and what he was struggling on, amazingly enough it was not a struggle, it’s just we all have those moments. So we have to–something else you got to keep in mind is, you’ve got to give each other grace. We all have rough days, we all have rough moments, sometimes we just need space, sometimes we just need grace that you’re not you know already beat myself up don’t help me kind of thing you know and give each other grace when you have those bad moments. So you need some time you know and I’m really open with my family, you know look I’m not having a good day or more so if anything, it’s been-I’m not feeling good today. You know but thankfully that’s gone so you know being vocal expressing yourself and taking the time for yourself you know, one of the things that has been an amazing blessing for me since I got sick is that, I would take time each week and soak in the tub. I was blessed by my dear friend Deanna and Rose who gifted me with a bath tab when I came back from my surgery because I needed to soak is part of my protocol. And you know that has been such a blessing to me to just take that time out and just relax. And sometimes I found that the best thing for me to do is just camp out there for a little while because the soon as I get up and get out of there, I got other chores to do and I’m going to have the demands of my family. So I’ve learned to cater to myself and some days I need to be in there a little longer other days I don’t. But finding that place and those things you can do that will help rejuvenate you. You know, if there were things you and your husband did when you were dating that gave you great joy and you’re not doing them now, why not? Enjoy life and enjoy each other. This was just really strong in my heart for Mother’s Day and I thought with us being in between both, I’m going to share this because it’s not just limited to one or the other. Men and women we both struggle, some men are stay at home moms, others are you know, out working in the nine to five you know so just varies but we’ve got a mix of society today and it’s just really important that we find time in this hustle bustle and this craziness to really find peace and just take time for ourselves because if you don’t, you know you’re not going to–you’re not going to be in a good way, you need to rejuvenate your batteries and fill yourself with joy and find those things that really give you meaning. You know something that we do every week, so every Wednesday night devotion and sometimes we’ll play games that night, it’s got a little crazy now with summer hitting us and some of the chores we have to do. But our Sunday is our day of rest and I mean that. We don’t do anything, we don’t work, we go to church or we have church at home depending on the circumstances, we eat good meals, we spend time together and rare days we play game-board games. On Saturdays we might be out picking around mushrooms whatever. But we spend time together and that day is such a joy to me, to have that date-regroup myself before another crazy week starts. We all have demands and I have another podcast available that is talking about how to avoid overwhelm and I kind of feel the two of these go together. You know it’s really important for you to be able to balance things out in your life and not over commit things; to try to help you rejuvenate and recharge your batteries. Recharging your batteries with your spouse can be a lot of different things. My husband and I used to get out on my motorcycle and we haven’t had that privilege now and we both missed it-I can’t tell you how. So you know it’s on our list of future things that something that we would like to do, but for right now we get out, we go for walks and hike and just spend time together. So if there were things you did previously that you can’t do now you know find something else and put that on your-you know To Do List, the future things that you want to do together. So there are so many things you can do but communication is huge and taking care of yourself because if you’re not good and you’re not happy, you can’t be your best self for everybody else either. So it’s just find a balance folks and just taking time to rejuvenate those batteries and that includes your children too because you know we thrive us moms and even new dads to spend time with those kids and to have more quality time with them. So instead of sitting and watching a movie or playing a video game you do something quality that you actually hold a conversation. My son and I walk a lot, we ride bike-right now I’m in drive and back and forth to his job because of the shuffle and vehicles –So I take that time to talk to him and spend time with him and he’s going to be out of my house soon, it’s scary that they grow so fast so, don’t waste your moments and don’t listen to that negative since the enemy just trying to kick you in the teeth and kick him right back, he’s behind you already. Just tell him to get back, step back because you deserve to hear good things about yourself and we all try really hard and we all push really hard and sometimes things just don’t go the way you wanted to and in my opinion, that’s–because they weren’t supposed to go that way. Everything happens for a reason so I hope this helps you today, I know is jumping around a bit but and my thoughts are a little scattered but my heart wanting to reach all you folks because I know there’s a lot of people out there struggling and have a lot on their plate and don’t get the breaks or don’t take the breaks and don’t have the resources to find peace in their life and in their marriage and with their family. So also I wrote–I was a co-author, there were 10 of us that wrote a book, “Courage Under Siege” and you can find that on Amazon on my author page by going to trayerwilderness.com/TammyTrayer and in that book you’ll find a lot of great stories of courage and overcoming and if you need something that’s going to empower you, I highly recommend it it’s a great resource. But my battery is running low, I’m out here walking so I don’t have a resource out here to plug into so I’m going to say goodbye and wishing you a good week and I look forward to seeing you next Friday you guys take care and God bless. You’re listening to the Mountain Woman radio show where you will learn something new every week. We hope you enjoyed the show and encourage you to join us at trayerwilderness.com and be sure to connect with us on iTunes. Remember your reviews on iTunes are very important to us and help us reach more people just like you. I found you about the time you said you were taking a break. I just happened back by. Sooo glad to hear you are feeling better. God is good indeed! You’ve had quite the journey. I’m just a ways south of you in Oregon (NE) and yes winter was nuts. Hope you continue to heal and gain strength. Just wanted to wish you well. Happy garden and soon to be canning season.